Many girls (and guys) all over the world will agree that it can be fun to get dressed up and make yourself feel gorgeous. But for most, behind-the-scenes, the process of getting ready can be far from glamorous, from bad lighting to small mirrors. Wouldn't it be amazing to feel like a star when getting ready and make the experience fun and exciting? Ever since I was a little girl I longed to have a Hollywood Mirror with bright light bulbs around the outside, just like the ones you see in old Hollywood films, backstage at shows or in more recent films such as Burlesque! As a performer myself there is something very magical, electric and glamorous about backstage dressing rooms. Clothes rails, makeup, shoes and the performers getting ready in their Hollywood Mirrors while thousands of people wait in excitement to see the show. Bloggers and YouTube gurus raved about Vanity Girl Hollywood but I was disappointed by the fact that the company only sold and distributed within the US and didn't ship to the UK. When I saw that the company were based in the UK and before me was a picture of a beautiful Hollywood Mirror, excitement ran through me. My long search was finally over...I had to have one!! Illuminated Mirrors are the first and only company that I have ever come across who manufacture and sell Hollywood Mirrors in the UK and if you don't live in the UK have no fear, Illuminated Mirrors ship Internationally! I was literally shaking with excitement at the thought of having my very own Hollywood Mirror in my home. The Hollywood Mirror from Illuminated Mirrors is functional, glamorous and classy. 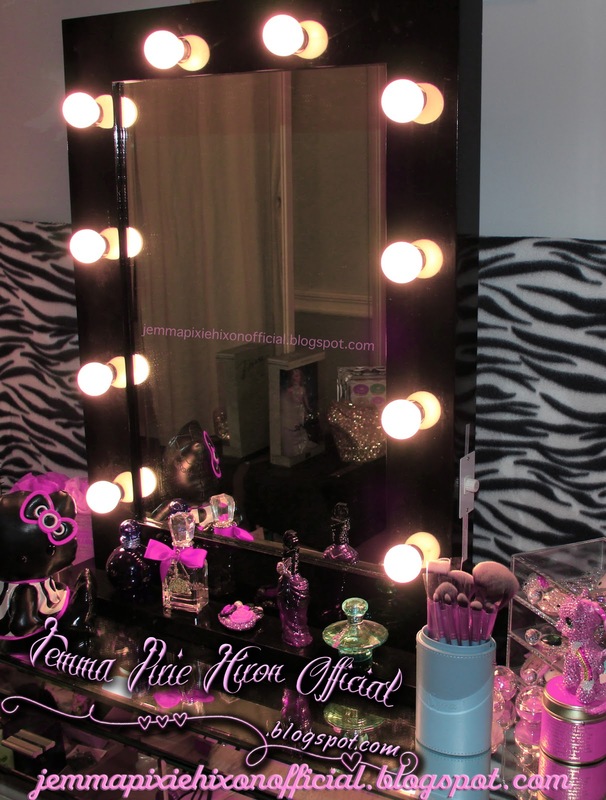 It is a high quality, well built, lighted vanity mirror and it is perfect for any makeup area or vanity/dressing table. The mirror is perfect for women at home, in salons or professional makeup artists to create a perfect, flawless look. 2. The feature that I love about this mirror is that on the right hand side it has a dimmer switch, enabling you to either make the lights brighter or dimmer to suit your requirements, current lighting and surroundings. The mirror is not only beautiful but functional too! Equipped with 10 opal, professional quality, dimming light bulbs (that are included in the box) the mirror offers the perfect light to illuminate skin tones and colours accurately, giving you control over every detail of your hair and makeup at any time of day or night! Lighting is one of the most important factors when applying makeup, it can drastically affect the finished results, so the dimmer switch is an amazing feature allowing you to embrace your perfectionism and create a flawless look. 3. I chose to get my Hollywood Mirror in Black, but the mirror is available in several different colours, so you can choose a Hollywood Mirror to suit your desired taste and decor. You can choose from Black, Pink, White or Dark. 4. You can either mount the mirror on your wall or attach it to the stand provided and place it on your dressing table or anywhere you wish like I have. All of the fixtures and fittings are included in the box, so you can put your mirror on the wall or stand as soon as you receive it. The mirror is very easy to put together and Illuminated Mirrors even have a “How to assemble your Hollywood Mirror” help video on the page, showing you how to either place your Hollywood Mirror on the wall or attach it to the stand. The mirror retails at £169.99 which includes all of the light bulbs, fixtures and fittings and stand, which I believe is great for the high quality, design and size of the Hollywood Mirror. 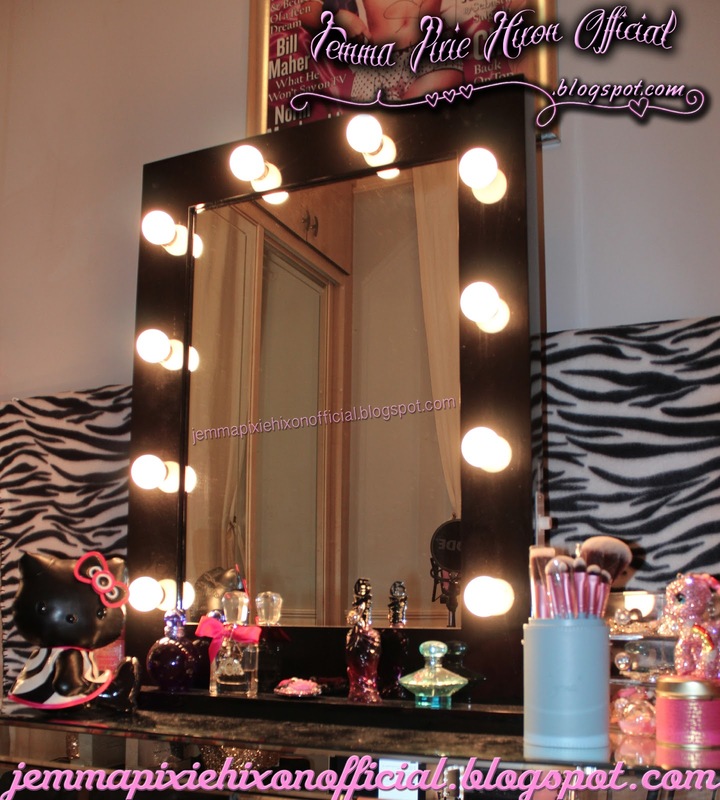 I love my Hollywood Mirror, it is the perfect focal piece for my vanity area. Not only does it look beautiful, but it is also the perfect mirror for applying your makeup, achieving a flawless look and making you feel glamorous while doing so! This product is a miracle. A makeup vanity mirror with lights gives a celebrity like feel. But this dream can be turned into a reality now without any difficulty due to the availability of makeup vanity mirror with lights. Original beauty box is a destination where makeup vanity mirror with lights are available easily. What a beautiful mirror and so are you! . Is it a hollywood mirror with lights UK?